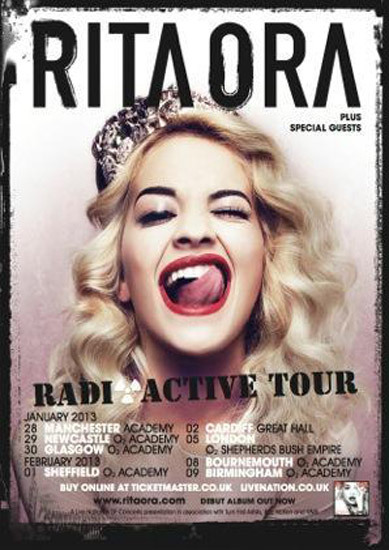 British singer/songwriter - Rita Ora has announced the tour dates to her UK tour "Radioactive". The RIP singer will begin her tour on the 28th January in Manchester and end on the 9th February in Birmingham at the O2 Academy. Ora, is planning on bringing a lot of surprise guests, so I'm guessing - Tinie Tempah, JayZ... You know, her usual... Maybe someone different this time? Let’s wait and see. Tickets will be available online from this Friday (7th December) via Ticketmaster.